Home › Word › "Perfect in Christ Jesus." Do you not feel in your own soul that perfection is not in you? Does not every day teach you that? Every tear which trickles from your eye, weeps "imperfection;" every harsh word which proceeds from your lip, mutters "imperfection." You have too frequently had a view of your own heart to dream for a moment of any perfection in yourself. 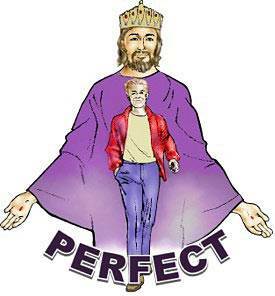 But amidst this sad consciousness of imperfection, here is comfort for you--you are "perfect in Christ Jesus." In God's sight, you are "complete in him;" even now you are "accepted in the Beloved." But there is a second perfection, yet to be realized, which is sure to all the seed. Is it not delightful to look forward to the time when every stain of sin shall be removed from the believer, and he shall be presented faultless before the throne, without spot, or wrinkle, or any such thing? The Church of Christ then will be so pure, that not even the eye of Omniscience will see a spot or blemish in her; so holy and so glorious, that Hart did not go beyond the truth when he said-- "With my Saviour's garments on, Holy as the Holy One."